Since 2014, Super Air Solutions is known to be amongst the prominent manufacturers and traders of this highly commendable range of Refrigeration Products, Cold Storage Room and Air Conditioner Products. Manufacturing of this range is done using the supreme quality materials and modern machines as per the standards set by the industry we also offer Repairing Services. Apart from this, these offered products are widely used in schools, colleges, houses and many other fields. For the streamlined execution of our business, we have segmented our facility into various parts. Backed by a well-connected distribution network, we have been capable of delivering the product safely at client place within the promised frame of time. Our team works in very close coordination with each other to accomplish set production targets of organization in a successful manner. Strict quality checking is performed over the entire range by our specialized team of quality controllers, who assure to make the supply of error free products in the market. Under the supervision of our mentor Mr. Santosh Patil, we are able to offer a high quality range to our products. Because of her vast industry experience and rich knowledge of this domain, we are growing such a fast rate and able to satisfy our clients in an effective manner. 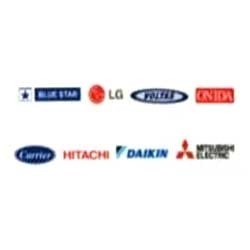 We are offering best quality refrigeration and air conditioner products to our valued customers at leading price range. Apart from this, with the help of our broad distribution network we delivered items within the requested frame of time at client place.